Members of the AaI&A Digital Print Research Program have now begun to receive their environmentally monitored (EM) prints. Both FedEX and UPS make it easy for a small business to get up and running with convenient shipping, handling,tracking, and customer notification. I have created a good “one way” package design for the initial shipments to participants. I figure I have nearly a year to solve the “easy return” part of the trip because the dataloggers will record for over one full year before memory is full. The project goal is an annual “checkup” for every print in circulation. Not to worry. 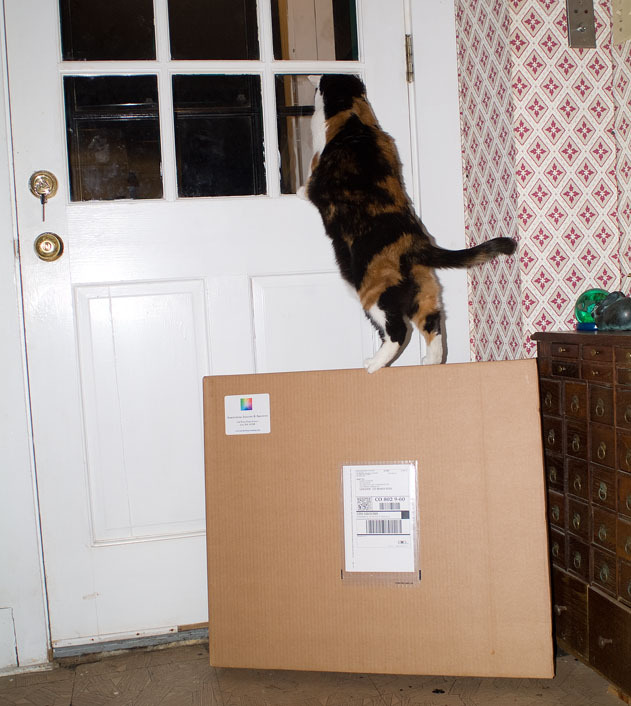 Members of Aardenburg’s Digital Print Research Program are receiving a package like the one shown in this photo (cat not included, but your AaI EM picture frame does come with batteries!). Refinements and revisions are still likely to come as the research continues, but all in all, I’m very pleased that the EM prints are beginning to hang in homes and offices around the country. So far, there are participants in Oregon, Colorado, Michigan, New York, and Massachusetts, a humble but satisfying start. 50 states each with 50 different print processes has a nice ring to it, so I just need to keep going! I have limited initial production volume at this point, and the product variety is presently a little like Henry Ford’s first model T’s. He is reported to have said “You can have any color you want so long as it is black”. Aardenburg Imaging & Archives has shipped copies of just one image for the loan program so far, and they are all framed in black! Each one is an image of the historic Hyde House taken in September, 2007 as our painting project was winding down for the winter (we still have two more sides of the house to complete). What these prints lack in artistic merit may one day be offset by their historic significance. They are, in fact, the inaugural image to be released from AaI&A into the real world. An inaugural print in Aardenburg’s Digital Print Research Program. 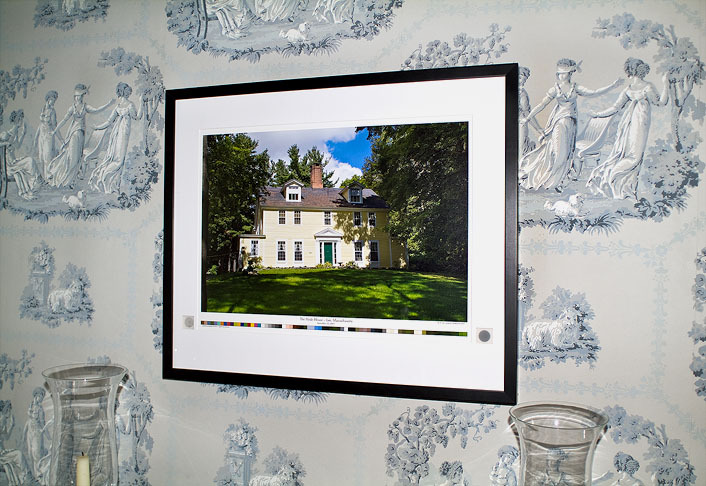 “The Hyde House – Lee, Massachusetts, September 16, 2007” by M.H. McCormick-Goodhart. Fuji Finepix S3Pro image capture, printed on a Canon iPF5000 printer with Lucia pigmented ink set and Crane Museo Silver Rag paper. In addition to the unsigned copies on loan as part of the Digital Print Research Program, there are also signed copies available (signed edition limited to 25 prints). A limited number of unsigned (for loan) and signed prints (for sale) are available. I’d be delighted to place all of the environmentally monitored unsigned prints first and even more thrilled with participants who actually would like to have both versions. Contact Mark McCormick-Goodhart at info(at)aardenburg-imaging.com with subject heading “Pilot Program” or Digital Print Research Participation” if you’d like to become a participant or collect one of the signed prints or both! The image size is approximately 13×19 inches framed in a 20×24 inch frame. In the coming year, my primary goal is to expand to more artists and printmakers, more printers, more inks, and more papers, and to get an image gallery of this activity started on the AaI&A website. There are other goals as well. Stay tuned! Changes have been made to improve the aesthetics of the necessary color patches. The AaI standard color set and the selected image color set have been laid out into a single row colorbar (it may take two rows for vertically formated images). The total length of the colorbar is sized to match the bottom length of the image. The idea was to make the color patches less obtrusive and more integrated into the overall visual appearance of the framed print. An ordered rectangular array is still necessary for I* metric calculations, but this requirement is merely a matter of re-ordering the single row colorbar data back into its original rectangular image pattern during the computer analysis. The “lower profile” colorbars give a less intrusive appearance to the framed print, so it was worth pursuing this idea. That said, some artists and viewers will still find any style color pattern detracting from the image while others may find it oddly fascinating. Such is the challenge of this real world digital print aging study! Refinements have also recently been made to the datalogger installation. I concluded that the opal glass diffusers needed to be replaced by a thin sheet of light diffusing material commonly used in LCD backlit constructions. The opal glass diffusers had a gorgeous look and excellent light diffusing properties, but the manufacturing tolerance on the thickness was ultimately going to be a problem in production. Additionally, as I have received more batches of Hobo dataloggers, I find that the unit’s low light specification of 1 footcandle is a little optimistic. Two footcandles (approximately 22 lux) is a more realistic performance expectation. My design goal for the EM picture frame was to reliably measure museum lighting levels all the way up to sunlight through window glass. This is a range of 50 lux to greater than 50,000 lux. Getting to the high end of this goal necessitated the use of a second datalogger with Neutral Density filter at the outset of the project, but guaranteeing the low intensity performance also required the switch from opal glass to a somewhat more transmissive diffusing material.